Springtime showers have been dragging through the Adirondacks this week. Fortunately, they've been intermittent, giving my students and me plenty of time to paint outside. Knowing that Tuesday would be mostly wet, we pushed ourselves on Monday to do a number of 5x7s. 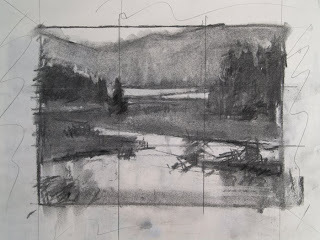 The intention with these sketches was to gather reference material for painting a studio piece. 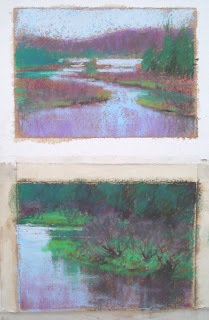 I had students make a color study of a composition they liked, followed by a study of a particular detail that would add interest to the scene. I've found that, quite often, the general color study doesn't show enough detail to make a convincing picture. To make it so, I like to sketch some detail that I can incorporate later. I "pushed" the color a bit in my studio piece. Rather than make a larger copy of what I did in the field, I wanted to not only improve the composition but also make the color more exciting. One rarely has time in the field to play with the design and color scheme, so a rainy day in the studio is a perfect opportunity to experiment. Above is my studio piece and, below, the two field sketches plus my studio value sketch. By the way, for those of you wondering how the bugs are, the blackflies, like the rain, have been intermittent. Still young, they haven't quite figured out what their purpose in life is and aren't biting. 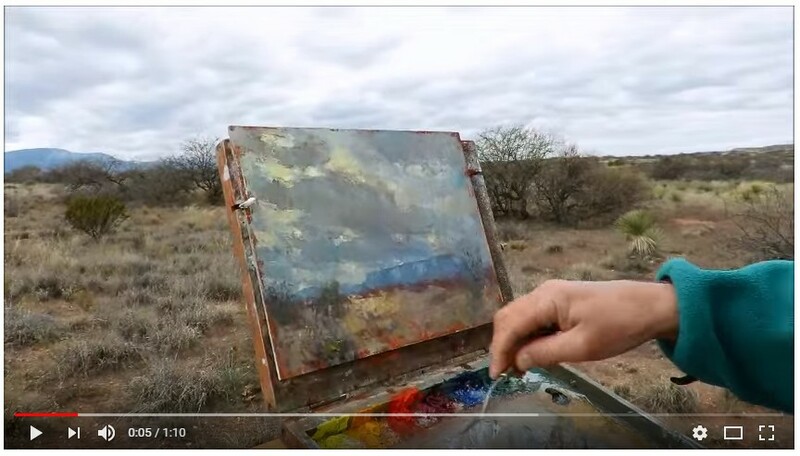 Thanks so much for showing this process, Michael! I will try your color study and detail sketch method - maybe if I don't push so hard to make a 'painting' I will be able to concentrate more on information gathering. 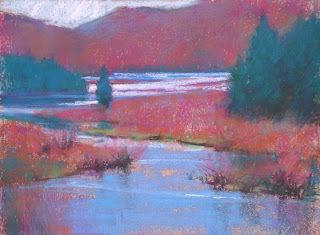 Your finished pastel is a beauty and I like you slightly enhanced colors. Thanks again for sharing your process, Michael. You're very generous. Hope we get to paint together sometime. Cheers. Great work. I liked all of them a lot. 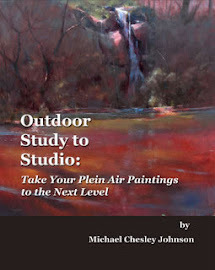 Thanks for sharing a pratical approach to studio time that captures the spriit of plein aire. I love the ziploc bag tip - the simple ones are always the best! I've never thought of that and yet it seemed so obvious once I read it! Thanks, everyone! And thank you, Katherine, for the mention! 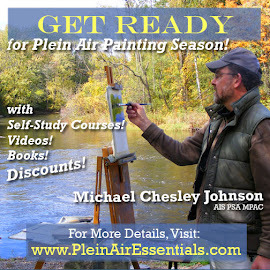 Fantastic demo, and a beautiful finished painting.